We love nostalgia at TBIR towers, and so when we found out it was almost (well one day out) the anniversary of Havant & Waterlooville’s biggest ever game AND they were playing at home AND we didn’t have to be in Denners for a change on a Monday, we had to go. What made this one even better is that Mr Grumble was allowed out to play. Mr Grumble lives like a Lord, quite literally, on the Surrey/Hampshire border. Having a young son, an old dog and a young girlfriend takes up most of his time and so chances of relaxation are few and far between. So when I suggested that we may be heading through the Devil’s Punchbowl he demanded that we pick him up and ferry him down the A3 to the game for some “Ale and hearty laughter”. It is hard to believe that high profile mergers still take place in the English leagues. 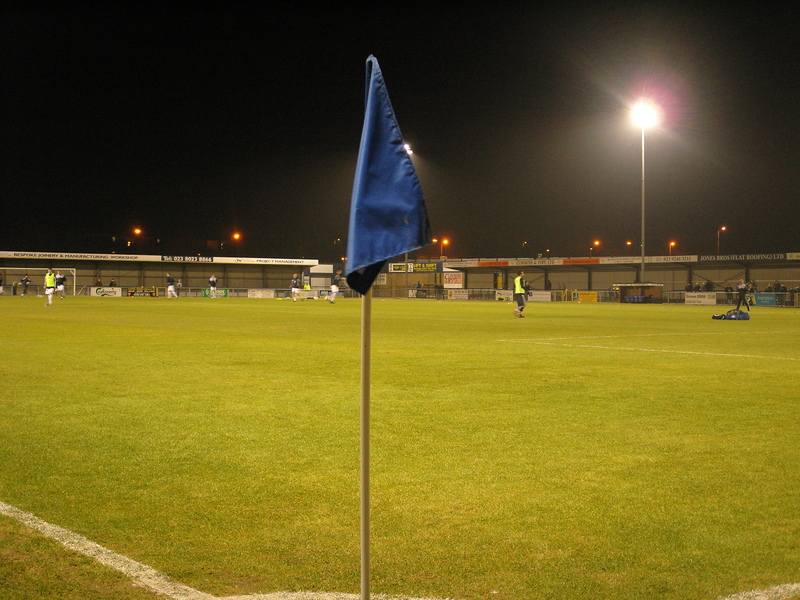 Apart from the merger between Dagenham and Redbridge, the only recent high profile merger was between Havant Town and Waterlooville FC in 1998. Both clubs were veterans of the Southern League at the time, and had bags of history to boot, wih Havant’s formation dating back to 1883 and Waterlooville’s 1905. 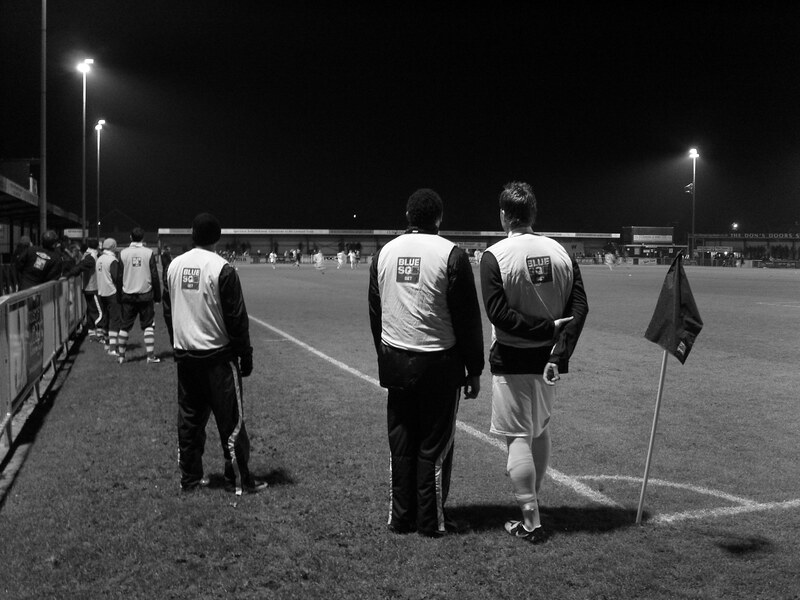 .The club formed in 1998 after a merger and a home was established at Havant’s West Leigh Park. In the season after the merger they won the Southern League South Division in 1999. Five seasons of Southern Leageu Premier football followed, where their best finish was 3rd. However in May 2004 when the leagues were re-structured, their 12th place finish was just enough to secure a place in the new Conference South. 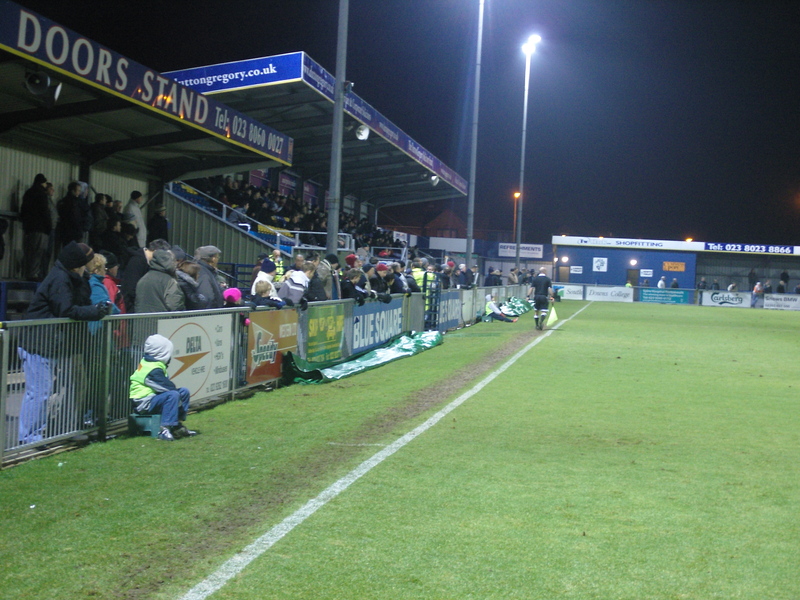 Two seasons later in 2005–06, Havant & Waterlooville missed out on a place in the end of season play-offs by a single point because of a controversial three-point deduction for breaking a gentleman’s agreement with Weymouth that Havant & Waterlooville’s ex-Weymouth FC player Tony Taggart would not play against his former club. Hawks manager Ian Baird claimed that an injury crisis had forced him to field Taggart in the home game with Weymouth. A season later they actually made the playoffs but lost to Braintree Town. However, they did get the taste of the FA Cup when they drew Millwall in November 2006 in the FA Cup 1st round, losing 2-1 in from of nearly 6,000 at Portsmouth’s Fratton Park. Twelve months later the bitterness was washed away as the club started on a journey in the FA Cup that would lead to world wide fame. Under manager Shaun Gale the club beat Bognor Regis, Fleet Town and Leighton Town to reach the 1st round. Then wins against York City and Notts County saw them in the 3rd round for the first time. A fantastic draw in Swansea gave the Hawks hope and in front of a sell out 4,400 at West Leigh Park they beat the Welsh team 4-2. With the draw already made for the 4th round, Havant knew that they faced the daunting, but hugely profitable trip up to the North West to face Liverpool at Anfield if they won. Over 6,000 fans travelled up to Anfield on the 26th January 2008 and were in dreamland as the club not once, but twice took the lead at Anfield – and this was in a time when Liverpool weren’t crap! Liverpool went on to score five in front of over 42,500. Ironically enough, at the time of the game Carlsberg only sposnored two English teams – Liverpool and Havant – yet missed a global advertising opportunity with a “If Carlsberg did the FA Cup draw, it would probably be the best draw in the world!! slogan. So back to the league and after a wimper instead of a bang end to the season, the club started the 2008/09 season as bookie’s favourites, primarily as they were the beneficiary of Lewes’s fire sale in the summer. Despite another run to the FA Cup 1st round The Hawks were involved in a relegation battle for most of the season but ultimately secured Conference South survival with three games remaining. This season it has been a bit of a mixed bag. In the lower reaches of the table coming into this game, but with games in hand. In fact so many games in hand that if they won them all they won be only 2 points behind Dover in 2nd place! They had hardly set the scoring charts alight this term, averaging just over a goal a game, but it was good to see average attendances were up to over the thousand mark although Dover and Woking had visited so far this season and they had some of the biggest away followings in the league. So with Mr Grumble safely picked up from the estate, and little traffic on the A3(M) we parked up at 7pm, walked into the bar and ordered up two pints of Tetley Mild, something we hadn’t drunk for years. A couple of fine young ladies soon took cash off us for a programme and our customary Golden Goal tickets. Lolly and I differ on these. I go for the “lets see what my minute is AFTER the first goal” whilst hers is the “let’s see what minute it is now” approach. I leafed through the programme and scoffed at the fact that they still had adverts from Xmas in there. Having recently approached the club about whether they wanted articles for the publication I could not believe my eyes. And then I saw that they were actually programmes from the original game back in November, but with a “Special Edition” sticker plastered across the front. I cannot blame clubs at this level for doing this, although an up to date team list would have been good to have been included. Havant & Waterlooville 2 Bromley 1 – West Leigh Park – 25th January 2010 Havant are one of the clubs in this league that feel charging for under 11’s is a sin and thus give free entry. I do not see any reason why all clubs should not adopt a standard pricing model. After all, if I bring Lolly to any game she wants feeding and a drink so the club get an additional £5 out of me anyway. Hats, scarves and gloves off to Havant for this policy. I have never been to West Leigh before, but can I tell you – it is what a perfect non-league ground should look like. Modest but functional main stand, plenty of room undercover on the shallow terraces, two tea bars serving chips with curry sauce (sorry, no gravy Northern Steve but they did have Bovril) and an immaculate playing surface. Yep, read that last bit again. An immaculate playing surface. This was 48 hours after their last home game was postponed, yet here was a pitch that was almost billiard table perfect. Bromley had brought a few fans themselves and they made quite a noise especially when completely against the run of play Warren McBean made the most of a misjudgement by the Havant centre backs and calmly rolled the ball past the keeper to make it 1-0. When I say against the run of play, I mean against the run of play. At that point, with just 26 minutes on the clock (our golden goal tickets were 14, 69 and 89) Havant had clocked up 7 corners to 1 in Bromley’s favour. And not surprisingly the lead only lasted two minutes before Ian Simpemba drilled home the equaliser after Bromley failed to clear another corner. This was a really good game, make no mistake in which both teams played a part, as well as the referee who despite issuing several cards, never let the game go out of control and encouraged a free flowing match. Half time at least gave us the opportunity to warm up as the temperature had dropped to freezing point, and I started to feel guilty that it was passed Lolly’s bedtime. 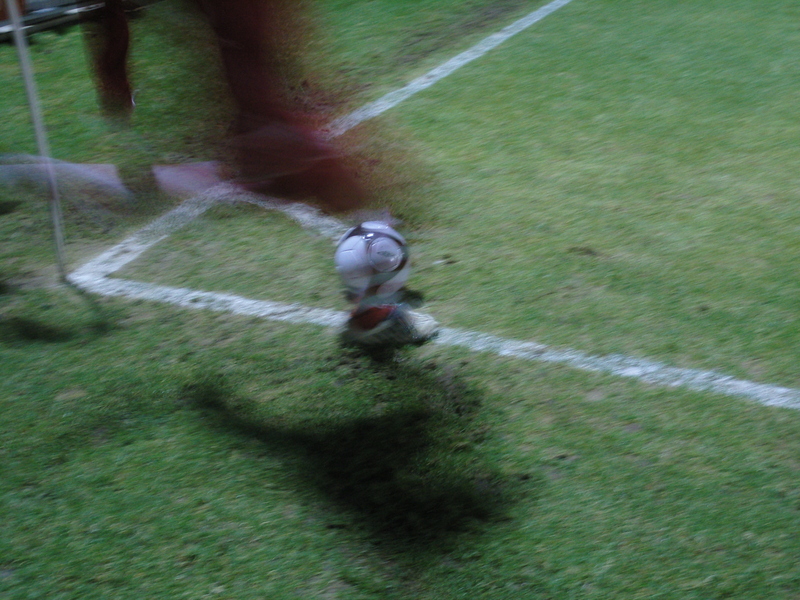 But that was soon forgotten with the start of the second half, and Havant’s assault on the Bromley goal. On the hour mark it was two one as a fortunate deflection saw the ball fall to a surprised Fogden’s path and he did not need a second opportunity. So a long overview home win for Havant, and a gutsy performance for Bromley. A break for the norm for me as I am normally in Denners on a Monday, a night out after school for Lolly and a chance for Lord Grumble to meet some normal people. Luvely Jubly About West Leigh Park West Leigh Park was home to Havant Town from 1982 onwards while Waterlooville F.C. played at the now extinct Jubilee Park. When they merged in 1998 it became home to the newly merged Havant & Waterlooville. It also serves as the venue for Portsmouth F.C’s reserve team matches. The ground has undergone a lot of work over recent years to bring it up to Conference National standard thanks in part to the money from the FA Cup run a few seasons ago. Medium sized covered terracing stretching from corner flag to corner flag behind both goals are ideal for supporters wishing to support their team from the end Bromley are attacking. While the main stand at West Leigh Park, which stretches just over half the length of the pitch, is home to 560 seats all available to use without paying extra. The main stand is also home to a couple of purpose built disabled areas allowing supporters in wheelchairs to witness the game from a raised area with space next to them for any friends or carers. West Leigh Park also houses a sizeable clubhouse, incorporating two separate bars. Note that the entrance is outside the main turnstiles, and it welcomes visiting fans. With the arrival of a large sponsorship deal from Carlsberg in June 2006, the Clubhouse was gutted and totally refurbished. It now incorporates four plasma screen televisions showing live sport. There are two tea bars in the ground open during matches, serving hot dogs, burgers, chips and other assorted popular fan fodder. There is also a reasonable fish and chip shop a short five minute walk from the ground along St Alban’s Road. Turn right out of the ground car park, left at the junction and follow the road round the bend. How to get to West Leigh Park Most fans will drive to get here so the best way from the east or west is to turn off the A27 into Havant at the Hayling Island roundabout (A3023). If coming from the west this is the first exit after the A3M split. Follow the road through the town centre crossing three sets of traffic lights until you go over the railway and come to a roundabout. Go straight on, through another four sets of lights. At the fifth, (after a petrol station on your right and the Heron pub on your left), turn right into Bartons Road. The ground will be on your right. At the top of the hill immediately after a pedestrian crossing, turn right into Martin Road. The entrance to the ground is several hundred yards along the road on your right. From the North come down A3 and exit the A3(M) at junction 2 and the follow the 1st exit (B2149) into Havant Road. Follow this road over two roundabouts (s/p Havant) and this then becomes Petersfield Road. The first major left hand turn is Bartons Road, and turn down here and the stadium is on your right. The ground has a moderately sized car park manned by stewards on match days. The club also have use of the car park outside the office buildings to the left of the ground. If you are coming by train, Leave the station by the north exit (that being the side that doesn’t have the main ticket office). Walk north up Leigh Road, directly ahead of you on leaving the station. After half a mile the road eventually comes to a dead end by a junction onto a dual carriageway. Cross the road and walk along the right hand side of the dual carriageway (this is pavemented, the route runs along a housing estate). Continue up to the next set of traffic lights, just before a petrol station and opposite the Heron pub, and looking right you should see a dead end road and the ground’s floodlights. Turn into the road and the ground entrance is a hundred yards on the left. How to get a ticket for West Leigh Park Pay on the door for all at Havant. Admission prices for league matches for the 2009/10 season are: Adults: £10, Senior Citizens / Students (with NUS card) / Children 11-16: £5, Children under 11 FREE when accompanied by an adult. There is no additional charge for entry to the main stand.